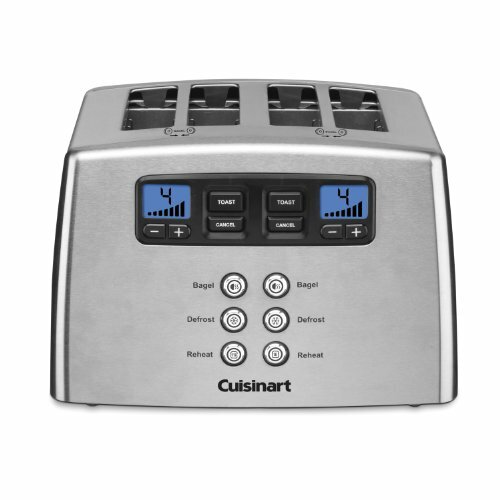 The Cuisinart CPT-440 is a Touch to Toast™ leverless 4-slice toaster. The stylish brushed stainless steel houses a unique motorized control that lowers items into the 4 extra wide slots at the simple touch of a button. This uses the dual control panels to toast combinations of bagels, English muffins, pastries and bread. keeping the track of progress with the blue backlit LCD displays and countdown timers for superior control. The Cuisinart Leverless 4-Slice Toaster has many exciting features for users of all types. You can extend the lifetime of your Cuisinart Leverless 4-Slice Toaster with the purchase of a FactoryOutletStore Factory Protection Plan. 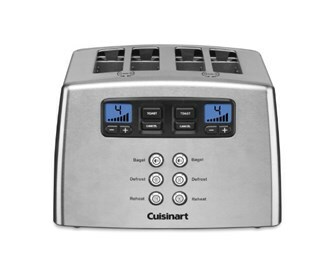 See the Cuisinart Leverless 4-Slice Toaster gallery images above for more product views. The Cuisinart Leverless 4-Slice Toaster is sold as a Brand New Unopened Item.